Hi, my name’s Joe. I’m a copywriter currently living in Austin, TX. But I wasn’t always a copywriter living in Austin, TX. In high school, I was a standout basketball player on a nationally-ranked varsity squad. Our national ranking was #15,863, and what stood out, mostly, was my attrocious 21% free-throw percentage. Here are my other stats. 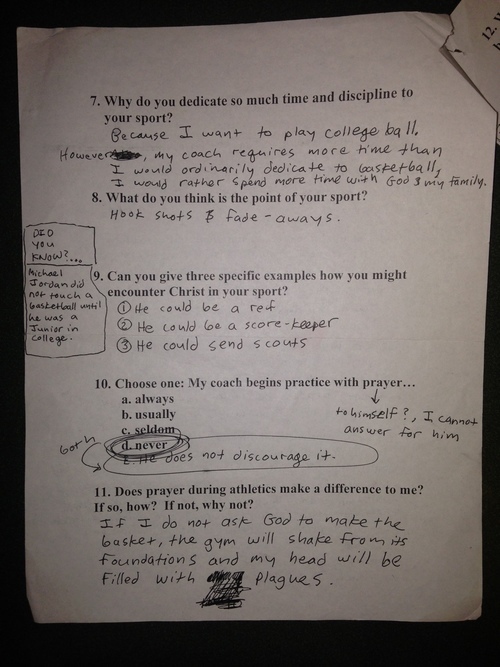 It’s safe to say the highlight of my basketball career was when my (very Catholic) high school administration asked each team member to fill out a (totally normal) survey about God and basketball. So I’m pretty sure this is the moment my fate was sealed: I would become a copywriter. No blasphemy goes unpunished. Anyway. That’s about it. If there are some gaps in my personal history that would like me to address, don’t hesitate to reach out.